What Will The Fourth Horn Do With All That Uranium? The Democrats repeatedly blasted Bush for not planning the aftermath of Saddam’s defeat better. This is how well Obama planned out the overthrow of Gaddafi. And it’s an open question whether Obama’s Libyan War will lead to countless American deaths, beyond the Benghazi four. Rows of the mortars and rockets stacked in crates, however, suggest some of the weapons have been shipped to Syria, along with hundreds of Libyans who have joined the rebel forces fighting Syrian President Bashar al-Assad’s regime. Say what you will about Bush, but I doubt the uranium would still have been sitting there after all this time. But Bush had national security priorities. Obama has a bizarre melange of Green Energy, Islam outreach and gay rights priorities. Uranium, like Benghazi security, isn’t his problem. Iran could produce enough weapons-grade uranium to build a nuclear bomb in as little as a month, according to a new estimate by one of the USA’s top nuclear experts. „We continue to closely monitor the Iranian nuclear program and its stockpile of enriched uranium,“ Meehan said. In the report, Albright said negotiations with Iran should focus on so-called „breakout“ times, or the time required to convert low-enriched uranium to weapons-grade. Albright, who has testified before Congress, said the negotiators should try to find ways to lengthen the breakout times and shorten the time that inspectors could detect breakout. ISIS‘ analysis is based on the latest Iranian and United Nations reports on Iran’s centrifuge equipment for producing nuclear fuel and its nuclear fuel stockpiles. Iran’s stockpile of medium-enriched uranium has nearly doubled in a year’s time and its number of centrifuges has expanded from 12,000 in 2012 to 19,000 today. „The Senate should move forward immediately with a new round of sanctions to prevent Iran from acquiring an undetectable breakout capability,“ he said. The White House said Thursday it will continue consulting with Congress „so that any congressional action is aligned with our negotiating strategy as we move forward,“ said Caitlin Hayden, a spokeswoman for President Obama’s National Security Council. Iranian President Hassan Rouhani has said his country has no interest in nuclear weapons but that producing nuclear fuel is Iran’s right. His foreign minister, Javad Zarif, has said Iran will not ship its nuclear stockpile to a third country. United Nations inspectors have found evidence of a weapons program in violation of Iran’s commitment under the Nuclear Non-Proliferation Treaty. 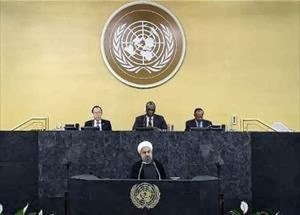 The USA and the U.N. Security Council have implemented crippling economic sanctions on Iran to sway it to take steps to assure the world it is not developing a bomb. „If they did that and they were caught it would be a smoking gun of a nuclear weapons program,“ Albright said. The barefoot rebel in the pork pie hat is a troubled man. A former human trafficker, today he presides over a vast arsenal in southern Libya that includes an estimated 4,000 surface-to-air missiles, each capable of downing a passenger jet, and has access to thousands of barrels of uranium yellowcake (ore sometimes used to produce nuclear weapons) in an abandoned desert warehouse. Between receiving al-Qaeda emissaries seeking to buy his stocks, and Western intelligence agents who want to secure them, he wonders who may kill him first. “Sometimes I’m afraid that al-Qaeda will get me,” said Bharuddin Midhoun Arifi. Najaf, Asharq Al-Awsat—In an exclusive interview with Asharq Al-Awsat, Sadrist Movement leader Moqtada Al-Sadr gave his view about the current political and sectarian situation in Iraq, the Maliki government, and what lies in store for the country. The Shi’ite cleric painted a bleak picture for Iraq’s future, saying that the country is presently hostage to terrorism, extremism, and violence and that the situation is only going to get worse. Sadr spoke to Asharq Al-Awsat from his base in the holy city of Najaf, saying that while his Mahdi Army—based out of Sadr City in Baghdad—may no longer be operating on the ground, it still exists. He also spoke about the state of affairs between his own movement and off-shoot Asa’ib Ahl Al-Haq, confirming that many members of the organization had returned to the ranks of the Sadrist Movement. Asharq Al-Awsat: How do you view the current situation in Iraq? What direction are things heading in? Moqtada Al-Sadr: I have said, and still say, that the situation in Iraq is a dangerous one, although the country is not at the peak of danger. Iraq is a hostage to terrorism, extremism, and violence. We are ruled by car bombs, killing, and bloodshed; only death rules. This is Iraq and this is the situation. Q: How did things reach this critical juncture? In my opinion, the main reason behind the current situation is the absence of a paternal ruling figure. If there had been a father-like ruler supporting all spectrums of society, then the situation would be different. Of course, the main reason for this situation is the ‘destroyer’ (Saddam Hussein) and the Occupation. Q: The Sadrist Movement played a pivotal rule in the formation of the current government, but you’re now speaking out against Prime Minister Nouri Al-Maliki. Why? I tried to commission someone else to head the government. I tried to secure this post being assigned to Dr. Iyad Allawi, but we did not succeed. I tried to commission (former vice president) Dr. Adil Abdul-Mahdi but we also failed in this. I tried with other parties and we also did not succeed, to the point that I was dubbed the kingmaker. Q: Were there external pressures that led to Nouri Al-Maliki being chosen as Prime Minister? Pressure in the real sense of the word? No. But as I said, this appointment was forced through. There is no better description than the word ‘forced’ because it came about as a result of general pressure, including from the people. Some said I was the one delaying the formation of a new government…therefore I was forced to choose who was already there, so to speak. Q: Do you think Maliki will remain Prime Minister for a third term? Yes, in this political climate he will remain Prime Minister for life. Q: What about all the political figures and parties that oppose him? It seems that many are against him, but in reality there are many other factors that must be taken into account. There is the electoral commission, the agents on the ground, and internal and external support. There are many elements that affect our government, not just the people, and this includes political plotting. Maliki has begun cooperating with the Kurds again, as well as [Parliamentary Speaker] Osama Al-Nujaifi and the Arab Sunnis. He is beginning to put forward a new narrative, and this is how he will obtain the votes he needs to survive. This is if parliamentary elections in Iraq take place on time…they may be delayed indefinitely. Q: Do you think, for example, that emergency laws or measures could be introduced in Iraq to keep Maliki in power without elections? Well said….plus there are other matters. You, as a journalist, know what follows the cancellation of elections. Q: Some observers say that the Sadrist Movement could form the next government? What do you think about that? If it is written for the Sadrist movement to form the next government with a patriotic and paternal spirit, then I am all for it. However I’m against this if it means the Sadrist Movement committing the same mistakes as the current government. I am not aligned with any one figure’s interests; I am for the Iraqi people. If Iraq benefits from something, then I am for it. I am known for condemning and issuing directives against those who belong to my own group, more than against those who belong to other parties. Q: What’s the story behind you initially distancing yourself from the political arena, only then to subsequently return to politics? This was not a distancing from political work, but rather from despair. The proverb says that ‘one hand does not clap.’ I hear many comments criticizing me, saying that I am against the Shi’ites or that I am out of tune with the Shi’ite community. I am also sometimes even accused of operating outside of political and legal norms. In reality, I walk in line with popular norms, with divine norms, which I have discovered through my own God-fearing conscience. There is a wheel that is spinning both inside and outside of Iraq; while I have become like the stick in the spokes of this wheel. They want to break me, but cannot. Q: What is the relationship between the Sadrist Movement, the organization’s political authority, and the Ahrar parliamentary bloc that is affiliated to your movement? There is a good relationship, but I criticize those who fall short in their work, and there are many such people. We do not say that the Ahrar parliamentary bloc or the political authority is infallible, but I can say that they are not as bad as others. Q: Is there any financial corruption within the Sadrist Movement or its affiliates? I am continually on the search for any cases of corruption among the Sadrist Movement, its political authority, and the Ahrar parliamentary bloc. If I were to uncover any corruption, I would reveal this to the world immediately. Q: Senior Sadrist movement member Qusay Al-Suhail announced his resignation as deputy parliamentary speaker, only to come out later and retract this. What’s the story behind this? It was a minor disagreement which was then resolved. There is no ambiguity, but we wish him to be more serious in his work and more beneficial to his community. I am hard on others and push them very much—those close to me know this and they dislike me sometimes for it. Q: Have you finished your seminary study, or will you seek to return to Qom? I’ve done enough. Grant me sufficient opportunity and time and I will continue to study, but the problems of Iraq, its people, and its political system, have delayed my studies. Q: Are you seeking to become a religious authority? How would I become a religious authority? My goal is to be a mujtahid (a quality in Shi’ite jurisprudence), but becoming a religious authority requires more than being a mujtahid. I am concerned about jurisprudence, but becoming a religious authority is another matter. Q: Shi’ite jurisprudence does not distinguish between Arab or non-Arab religious authorities, so why are there no Arab Iraqi Shi’ite authorities? Q: Does the Mahdi Army, which is under your leadership, still exist? Yes, but it is not currently operating. Q: What’s your relationship with Asa’ib Ahl Al-Haq, which began as a splinter group from your organization? Are relations still tense? They now come and sit down with us. They are returning to the ranks of the Sadrist trend and uniting it. There is no longer any Asa’ib Ahl Al-Haq; they are leaving this group to return to us. What remains of the Asa’ib Ahl Al-Haq have moved closer to the government, and we can call them sponsored militias. By the government, and this is something that is unacceptable. Q: While we’re on the subject of the government, are you satisfied with the government’s operation? Bear in mind that anti-government protests have been reported in a number of provinces. The people were not united in these demonstrations: if they had been, they would have achieved something. If you’re asking me about the government’s performance of its duties, I say that if it had performed any of its duties I could comment, however since it has not performed anything, what can I say? Q: So you are saying that the Baghdad government has failed to perform any of its duties? The government has not done anything. The only thing that the government has sought to do is preserve its grip on power, and they have succeeded in that. Q: What is their objective in maintaining power? Preserving power has become a goal in and of itself. We can’t describe what is happening as being corruption; if you have a better description for this phenomenon, I would prefer you use that term. I cannot think of another word right now, but if you have a better one please use it. Q: The Iraqi people specifically used this term, taking to the streets across the country to protest against government corruption. Do you agree with this? It is the people’s right to use any description that they want, but I would say that the government is paralyzed and cannot do anything. Q: Which political bloc or party is the Sadrist trend closest to? We are close to all of them. We have good relations with the Kurds. We have a strong relationship with the Islamic Supreme Council of Iraq (ISCI) that is led by Ammar Al-Hakim, as well as the Iraqiya bloc and many of its members, most notably Dr. Iyad Allawi. I have tried to develop good relations with the State of Law coalition (SLC), led by Prime Minister Nouri Al-Maliki, but it seems that there is a big wall between us that we cannot break down. However there are ties that bind us to that group. Q: Is this a political wall? Or is this caused by attempts to exert control over Iraq’s Shi’ites? It is a political wall, and this is completely unrelated to the Shi’ite issue. On the contrary, Maliki and his coterie are from the Islamic Da’wa Party, and this means that they belong to my uncle and father’s party [Muhammad Baqir Al-Sadr and Mohammad Mohammad Sadeq Al-Sadr had been leading members of the Islamic Da’wa Party]. Q: Do you think the Islamic Da’wa party under Maliki today remains the same party that your father and uncle had been a part of, namely a party formed in the name of just and noble values? Maliki’s bloc makes this claim, but I disagree. They claim that they are a continuation of the original Islamic Da’wa Party which was founded by my uncle Mohammad Baqir Al-Sadr, and my father, Mohammad Mohammad Sadeq Al-Sadr. However, a lot of the rules and principles have changed. Many of the party’s older membership demonstrate sincere patriotism and dedication, but unfortunately they are not in control of the party. New members are dominating the party, and they have changed many of its principles. Despite this, I wish them luck. Q: Would you describe the Islamic Da’wa Party as the ruling party? Yes, even metaphorically. The Islamic Da’wa Party is the ruling party. Q: What’s your view of the Kurdistan region’s latest parliamentary elections? The transparency and fairness of these elections have been confirmed internationally, and as long as this is true, I wish them luck in achieving democracy. Q: What is your opinion of the way that the Kurdistan Region is being governed? How do you rate their democratization process? We need some open-mindedness because change doesn’t happen overnight. Nechirvan Barzani, head of the Kurdistan Regional Government (KRG) is my friend, and we are always in contact. He is trying to repair, construct, and innovate as much as he can. In Erbil, we see continuous cooperation and good relations between the people and the government. As for the rest of Iraq, we cannot say the same. Q: Why hasn’t Baghdad tried to borrow from the Kurdish experience in building and developing Iraq? Do you think may be out of arrogance or conceit? The reason is political conflict. Barham Saleh, former Iraqi deputy prime minister and former KRG prime minister, informed me that he had requested that a company be tasked with establishing an electric power plant in Najaf, but this was refused. He told them that he would undertake this project for free for the families of Najaf, but they still refused, fearing that this would be viewed as a victory for the Kurds. Q: In your opinion, who is responsible for the daily bloodshed taking place in Iraq? Everyone is responsible for this bloodshed without exception, but of course the degree of responsibility differs among our leadership, the people, the government, religious leaders, the security apparatus, intelligence agencies, and others. Q: If we are all responsible for the spilling of Iraqi blood, who can we hold accountable for this tragic situation? At its core, Saddam Hussein is responsible for this, but it is illogical to try to correct a mistake by making another mistake. This reminds me of the story of a house with mice problems. The family wants to get rid of the mice so they buy a cat, only then to be confronted with a cat problem. To solve this, they buy a dog. Then, of course, the dog becomes a problem so they bring in an elephant to get rid of it, and once the elephant becomes an issue, they bring in a mouse to scare off the elephant! This is precisely what is happening in Iraq today. Security officials, the commander in chief, the Ministries of Defense and the Interior, and all the security leadership, are shouldering the responsibility; but we should not hold them completely responsible. Q: What about external factors? This is a good point. External factors also have a large impact on this issue, negatively affecting the domestic situation. Q: Is it true that Iran is interfering in Iraq’s domestic affairs? Of course. In fact, Iran does not try to conceal this. Everybody is trying to support their own country, and it is known that controlling Iraq supports Iran and its politics. Q: What about Turkey? Do you think Ankara is negatively interfering in Iraqi affairs? No, I don’t consider their intervention negative. They intervened in the demonstrations in western Iraq, in Mosul, Al-Anbar, and Samarra. However, other than that, they don’t interfere in our internal affairs. Q: What’s your view of the massive demonstrations that took place in Iraq’s western provinces? I view them as being popular and legitimate, so long as they are peaceful. Q: Do you support them? I support them verbally and morally, but I have my own demonstrations that need my support. Q: Is it possible to unite your demonstrations with those taking place in the western provinces? No…they are too far away. This means that sectarian division has been imposed on us, against our will. Q: So this is solely due to geography and distance? This is due to the geographical factor, and also for fear of Sunni extremism, and this far outweighs my own fear of Shi’ite extremism. I call on the Sunnis to be more courageous in addressing extremism. Whenever I see Shi’ite extremism or militancy, I speak out against it; Sunnis must also condemn the sectarian attacks on Shi’ites and say outright that this is wrong. I’m not alone in saying that bombing Sunni areas is wrong and when I hear Shi’ites insulting Umar Ibn Al-Khattab [Second Caliph of Islam and divisive figure between Sunnis and Shi’ites] I leave the mosque. A brave person must say: ‘This is not right,’ while Sunnis should also know that insulting Imam Ali is wrong. Q: Do you think there should be legislation to criminalize sectarian insults? The law emanates from rational people; we should produce legislation that addresses this trend. Q: What’s your view of government decisions prohibiting and banning demonstrations? Such decisions are undemocratic, violating freedom and oppressing the Iraqi people. Q: Over the most recent period, the Sadrist Movement has largely refrained from calling for protests. Why? We called for a million-man march on many occasions in the past but we have grown weary. I do not want the Sadrist Movement to become over-burdened, we are part of the Iraqi people, and the Iraqi people may have other ideas that we don’t want to appropriate by demonstrating. If the Iraqi people are united, I’m one hundred percent behind demonstrations. Q: The Sadrist movement is a big part of the Iraqi opposition and enjoys support by many Iraqis regardless of sectarian association. Is the Sadrist Movement attempting to become a more mainstream organization, away from sectarian or ethnic characteristics? First, the opposition must be constructive and not destructive. Second, we are not moving away from our Islamic identity, but we are also not an organization that is just for Muslims, this would be a grave error. Our Islamic nature is paternal, and this is something that both Muslims and non-Muslims can get behind. Our movement is a paternal one, and it brings everyone together without exception, whether Muslim, non-Muslim, secularist, Christian, or a member of any other religion or sect. Q: Your relations with Arab states are receding. Why is this? Where are the Arabs? They are all occupied with the Arab Spring revolutions. We have a plan to visit Bahrain in order to bridge the gap between our viewpoints and move away from the spectre of sectarian strife, God-willing. Saudi Arabia is sacred for us, as the holy cities of Mecca and Medina are located there. Q: What do you think is the cause of sectarianism in Iraq and elsewhere? These are the plans of America, Britain, and Israel. They did not benefit from occupying Iraq, as we kicked them out of our land, and so they sought refuge in sectarianism in order to weaken and control us. Q: In your view why have US troops left Iraq? Who or what is responsible for getting them out? Military resistance, both Sunni and Shi’ite. All Iraqis resisted the occupation. Q: Maliki claims that he is behind the withdrawal of US troops. Q: What’s the latest regarding the Sadrist detainees? They are still being held to this day. The main issue is that they have not been brought before court or charged with anything; if they were accused of something and evidence was brought against them, I would not stand with them. I want all innocents and resistance fighters out of detention. Attacking occupation tanks is not a crime; it is resistance. A lawmaker handed me a file on some of these resistance fighters that said they were accused of targeting American tanks and thus are considered terrorists. This is shameful! Even America doesn’t consider this terrorism. Even [former US president] Bush said that if his country were occupied, he would resist. Q: Will you seek to participate in the next elections in a strong and sustainable manner? Yes; I’m trying to unite Shi’ites and if this happens we will participate. I am also trying to lessen the possibility that citizens will refuse to participate in elections, because this is a scary prospect. Q: Do you think that patriotism has subsided among Iraqis? Very much so. I’d say that the fear is not of sectarianism in politics, but of people themselves becoming sectarian. Q: One last question, what do you think lies in store for Iraq, particularly the country’s near future? The near future will be bad. And it will only get worse. For the last several years, Iranian diplomats have been dangling a „fatwa,“ or religious decree, in the face of western governments, as if to hypnotize them further into the abyss of negotiations. 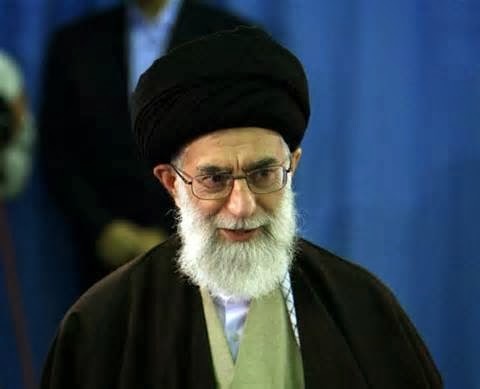 The Iranians allege that the fatwa has been issued by the Supreme Leader Ali Khamenei and that it bans the development and use of nuclear weapons. At a minimum this should sound bizarre to the assiduous mind, if not outright farcical and ludicrous. Does the Iranian regime expect to fool the West into thinking that it will not seek nuclear weapons with a pinky swear? Yet Washington’s top diplomats have surprisingly added to the glimmer of the mysterious fatwa. The culmination of this bizarre saga was a declaration by President Obama. „I do believe that there is a basis for a resolution (because) Iran’s supreme leader has issued a fatwa against the development of nuclear weapons,“ he said at a White House briefing after calling his Iranian counterpart Hassan Rouhani. This is ironic and peculiar. It is ironic because there have been lots of fatwas issued by Khamenei and his predecessor, as well as other regime clerics, which patently endorse cold-blooded murder, terrorism, religious discrimination, abuse of women, torturing political prisoners, draining the blood of dissidents, and many other horrendous acts, including the massacre of 52 Iranian dissidents, members of the main Iranian opposition, the Mujahedin-e Khalq (MEK), in neighboring Iraq on September 1. Why not use those as a basis to abandon engagement with a barbaric regime? And, it is peculiar because the fatwa is a hoax. The list of nearly 500 fatwas, reported to have been issued by Khamenei, makes it clear that despite all the hype over the years, there is no credible evidence that such a fatwa even exists. In July, Fars News Agency, affiliated with the Islamic Revolutionary Guards Corps (IRGC), published the list, dating back to 2004. None mentioned banning nuclear weapons. 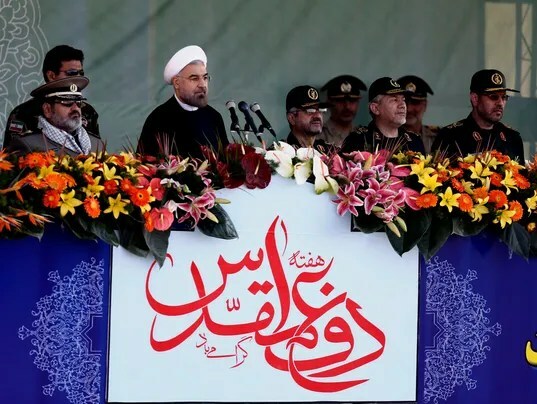 Khamenei was even pointedly asked if it is „forbidden to obtain nuclear weapons,“ and answered in writing that such a question has no ‚jurisprudential aspect,“ and so it is not even possible to answer it. In other words, it cannot be the subject of religious decrees in the first place. First, in the summer of 1988, Khamenei’s predecessor, Khomeini, issued a fatwa ordering the killing of all political prisoners across Iran who opposed the regime. In contrast to Khamenei’s hoax, Khomeini’s original hand-written fatwa was published by his designated successor Ayatollah Hossein-Ali Montazeri. As a result, according to Amnesty International, „largely secret, summary and mass executions“ ensued. Tens of thousands perished, the overwhelming majority were MEK members and sympathizers. It is now the 25th anniversary of that massacre, which the Parliament of America’s neighbor to the north, Canada, recently described as „genocide.“ Since Obama has now relied on Khamenei’s fatwa for a major policy decision, will he use Khomeini’s real fatwa as a basis to stand up for American Constitution’s core values, end 25 years of silence, and finally ask Iranian regime authorities, including Rouhani’s Justice Minister, who was a member of a three-man Commission which implemented the fatwa, to appear before an international tribunal to respond to charges of genocide? If not, why? Is President Obama really prepared to stake the highest priority foreign policy issue of his presidency on what is at best a hoax, and at worst a deceptive tactic to lure him into another series of prolonged and fruitless negotiations? Is he prepared to leave office while leaving the world with a nuclear-armed fundamentalist regime in Iran? Safavi is a member of the Foreign Affairs Committee of the National Council of Resistance of Iran, which seeks to replace Iran’s ruling theocracy with a democratic, secular and non-nuclear republic. The head of the Sadr Movement Moqtada Al-Sadr accuses Nouri Al-Maliki of „failure“ and scheming to remain in power. Najaf, Asharq Al-Awsat—In an exclusive interview with Asharq Al-Awsat the head of Shi’ite Sadr Movement Moqtada Al-Sadr said that Iraq is ruled by terrorism, and predicted that the situation will worsen in the near future. “Iraq today is at the height of danger and has become a prisoner of terrorism, extremism and violence,” Sadr told Asharq Al-Awsat. Sadr also predicted that the general elections scheduled for next year would be delayed until further notice or be completely cancelled, and did not rule out the enactment of martial or emergency laws to enable Maliki remain in power. The controversial Shi’ite figure said from the onset he did not support Maliki’s nomination to the premiership, and that he pushed hard for the nomination of the head of the Iraqi List Iyad Allawi or the former Vice-President Adil Abdul-Mahdi. Sadr said that he finally gave in to Maliki taking office due to the pressure he was placed under. Iraqi Shia cleric Muqtada al-Sadr and Ali al-Husayni al-Sistani have condemned people who insult the family and companions of the prophet Mohammed (p.b.u.h) in order to stir sectarian tensions between Sunnis and Shias. Iraqi Shia cleric Muqtada al-Sadr and Ali al-Husayni al-Sistani have condemned people who insult the family and companions of the prophet Mohammed (p.b.u.h). In recent days, a group of people in Baghdad insulted Omar who was one of the most powerful and influential Muslim caliphs and a companion of the prophet Muhammad, as well as Aisha, the prophet Muḥammad’s wife, over a social media network. After the insults, Ali al-Husayni al-Sistani condemned these people. Sunni scholars welcomed the condemnation. Muqtada al-Sadr described people who share insulting remarks as „headless and ignorant“ and apologized to all Muslims for the remarks. The Shia represent the second largest sect of Islam. The term „Shia“ literally means the followers of Muhammad’s son-in-law and cousin Ali, whom the Shia believe to believe was the rightful successor to the leadership position of the Muslim world after Muhammad. They feel that the first three caliphs (leaders) of Islam after Muhammad (Abu Bakr, Omar and Othman) usurped his right to succession. Iraqi Sunni and Shia leaders signed the Mecca Agreement in October 2006 to stop the sectarian tension and bloodshed in the country. (Reuters) – The red flag of revenge flies over a house in Baghdad’s Shi’ite stronghold of Sadr City, where residents are mourning the victims of a triple bombing that killed 85 people at a funeral in the same place at the weekend. Young men with pistols tucked into their belts or rifles slung over their shoulders patrol the streets of the sprawling, impoverished swathe of the Iraqi capital, no longer trusting official security forces to keep Sadr City’s three million people safe. No group has claimed responsibility for Saturday’s attacks, but many suspect the Sunni militants of al Qaeda, who have been this year and mounting attacks that have reversed a declining trend in sectarian violence that reached a climax in 2006-07. The deterioration of security is undermining Shi’ite Prime Minister Nuri al-Maliki, who is also commander-in-chief of the armed forces, and who won the last election by presenting himself as the man who restored a measure of stability to Iraq. „Logic dictates that the more attacks by al Qaeda, the less credibility will be left for Maliki,“ said former general Shakir Salman, a military analyst who advises Iraq’s defense ministry. Trained and equipped by Washington at a cost of nearly $25 billion and more than a million strong, Iraq’s security forces have yet to master foes who fought the U.S. military in the years after the invasion that toppled Saddam Hussein in 2003. More than 5,500 people have been killed in violence this year, prompting concerns of a return to sectarian bloodletting. So far, the killing has been largely one-sided. Shi’ite militias, most of which disarmed, joined the reconstituted army and police or entered the political process in recent years, have refrained from retaliating for attacks by Sunni insurgents. But in Sadr City, where the Shi’ite Mehdi Army militia still has a strong presence, people are losing patience. „I swear to God, if I caught anyone who was involved in that explosion, I would hang him from an electricity pole and burn him one million times,“ said Ahmed, a young man from Sadr City who lost a relative in Saturday’s bombings. Rivals of Maliki, both Sunni and Shi’ite, are likely to seize upon the worsening security outlook to thwart any ambition he may have of seeking a third term in next year’s elections. „The failure in the management of the security file won’t affect his chances for the next election: it already has deeply affected him,“ said Hakim al-Zamili, a senior lawmaker who sits on parliament’s security and defense committee. In response, the government is looking at plans to create a state-backed Shi’ite militia to combat al Qaeda and prevent local groups taking matters into their own hands, officials say. The idea is to combine elements from the Asaib al-Haq and Kata’ib Hezbollah militias, which ceased fighting in Iraq after 2011, as well as members of the former Mehdi army, which Maliki defeated in a U.S.-backed offensive in 2008. Mehdi Army leader Muqtada al-Sadr has since become a potent force in mainstream politics. Sadr City, once known as Saddam City, was re-named in honor of Muqtada’s father, a Shi’ite spiritual leader who was assassinated during Saddam’s rule. In a speech on Saturday, hours before the bomb blasts in his bastion, Sadr urged his many followers to show restraint. Following the funeral bombings, tribal leaders from the area decided to send a delegation to Sadr next week and petition him to remobilize the Mehdi Army to protect Iraq’s Shi’ite areas. For now, neighborhood watch committees are springing up in Sadr City to help security forces patrol the streets. Ali Hussein, who may lose a leg after being wounded in Saturday’s attack, in which seven of his cousins were killed, said there was no choice but to act. Iran is playing its cards very carefully. It seems that the elections — in which Hassan Rowhani emerged victorious — were part of a grand Iranian scheme to deceive the world and to get rid of the sanctions that have crippled its economy. Obama and company must tread carefully on the nuclear issue. Iranians have realized that rhetoric would not pay off. The venom spat by former President Mahmoud Ahmadinejad failed to make any difference; it actually pushed Iran into an economic mess. Having realized the fact, an ever-smiling Rowhani has been installed; who could keep the West engaged in sweet talks and the regime would continue enriching uranium behind the scenes. Rowhani, to me, is nothing but a distraction, a tool to keep the West busy and to buy Iran time to further its hegemonic designs in the region. Obama is, no doubt, in a tight spot as the recent thaw in US-Iran ties has created unrest among US’ Arab allies. The recent telephone conversation between Obama and Rowhani has set the alarm bells ringing in the Gulf region. The possibility of a shift in Gulf countries’ policies toward US cannot be ruled out. Russia is ever ready to exploit the situation. The only impediment in Russia’s way is its support for Bashar Assad’s regime. The situation, however, can change at any given time. Asked whether he believes the Iranians chose to elect President Hassan Rohani because they want change and a lifting of the sanctions, Netanyahu said he’s sure they do, but stressed that Iranians are not governed by Rohani but by Ayatollah Khamenei.